We have little shortage of kiddo books around here! But, I'm always looking for new titles to share with Evie. She loves her board books, and looks through them multiple times throughout the day. I've noticed that the more color & interactive the storylines are, the more she is apt to listen, even at her young age. Not to mention, fun illustrations keeps her busy when she 'reads' them herself. My goal is to start sharing more kiddie book reviews! Oh, and I will be hosting two kiddie book giveaways this month, so be sure to check back soon. 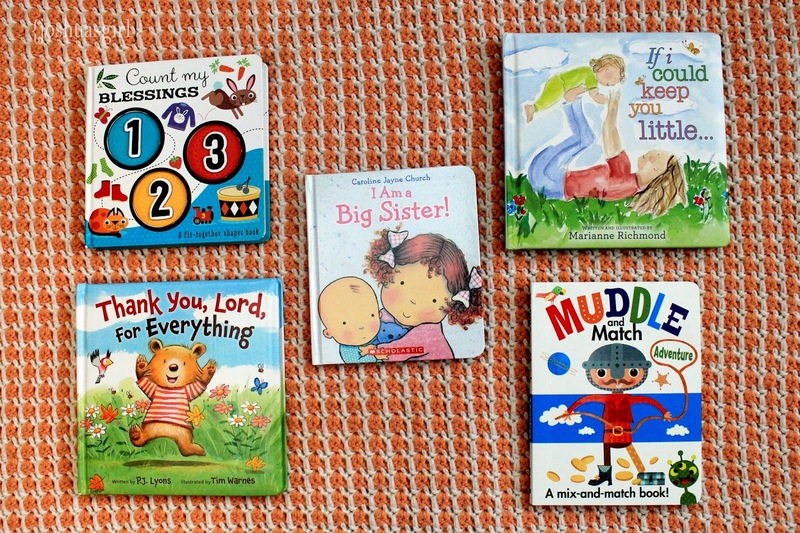 1) Count My Blessings 1-2-3: This charming little book is a favorite of Evie's. They have raised artwork and an interactive storyline. When we started reading this, she would say the world "2", and point to each item. I'm surprised at how quickly she caught on! 2) Thank You, Lord, For Everything: I just love this book. It's such a simple, and easy way to remind your kids to be thankful for all that the Lord blesses us with. The illustrations are precious, and Evie loves me to read this one to her. 3) I'm a Big Sister: I was so excited to find a copy at my local Target when Ella came along. We read this one A LOT when we were transitioning to a family of four. I don't know if she really grasped the concept, but she brings this one to me ALL the time for me to read to her. So, I'm thinking she gets it. Hehe. 4) If I Could Keep You Little: Ok, I'll admit, I bought this one for myself. It's the sweetest story of a mother telling her child how she would love to keep them little, but why she cannot. I might read it more than I'd like to admit. Because, yes, I want to keep them little, but I cannot. It's balm for a mother's soul. 5) Muddle & Match: My daughter was first introduced to these cute books by my friend Kristina. She is OBSESSED with these books. She pulls them out and flips through the 'muddled' story lines throughout the day. It's very interactive, and a great storyline for a wide age range in my opinion. Plus, the illustrations are super colorful. You can check out these fun Usborne books here (it's through my friend's web site). If I Could Keep You Little is one of my favorites too. Always make me cry!